Nerve structure, dorsal root ganglion (DRG), growing into and onto fiber scaffolds. (A) Schematic of dorsal root ganglia (DRG) seeded onto a fiber scaffold. (B) Neurite growth from a DRG through a grooved, 5 mm fiber scaffold (red = neurofilament, cyan = fiber scaffold). (C) Higher magnification image of neurite alignment along grooves inside the fiber. 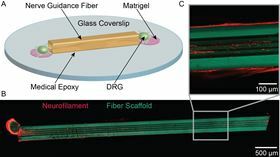 Polymer fibers of the right size and shape could help regrowing nerve cells repair tissue damage after injury, according to scientists from Massachusetts Institute of Technology (MIT) and Northeastern University [Koppes et al., Biomaterials 81 (2015) 27]. Nerve damage is very difficult to repair, with injuries to the peripheral nervous system leaving 60% of patients with life-long effects. Neural tissue has limited regenerative capabilities but can repair what are known as ‘small-gap’ injuries if the ends of damaged nerves are re-joined. For larger injuries, autografts of donor tissue can be used to bridge the gap but the body’s immune response, scarring, neuron death, and lack of support for regrowing neurons limits success. As an alternative to autografts, artificial scaffolds can support and guide the regrowth of neurons. Most of the synthetic and biopolymer scaffolds explored so far have had a cylindrical cross-section, but there is mounting evidence that the size and shape of a scaffold can have a significant effect on cell growth. So Polina Anikeeva of MIT and lead author Ryan Koppes, now at Northeastern, together with their colleagues, systematically analyzed fiber-like scaffolds of the polymer polyetherimide (PEI) with different cross-sectional shapes – cylindrical, rectangular, or grooved – to identify the key features for enhancing cell growth. “We see a drastic difference in neurite growth and alignment for the different fiber geometries,” Annikeeva told Materials Today. Neurites showed the fastest growth and greatest alignment on grooved scaffolds and the slowest in conventional cylindrical fibers. But in the absence of any topographical features, neurite growth and alignment can be improved by reducing the core size of the fiber. Why neurites respond in this way to the scaffold geometry and size is not completely clear, but the researchers believe that grooved or narrow fibers more closely resemble the dimensions of actual nerves. “Neuronal processes inherently follow topographical features and incorporating those cues into synthetic nerve grafts is critical for a device intended for regeneration,” explains Koppes. The researchers used a technique common to fiber photonics, the thermal drawing process (TDP), to fabricate their scaffolds. Rather like a stick of rock, a template or ‘preform’ in the required shape is first made and then heated and pulled into long fibers with internal diameters ranging from 50 to 200 microns. The other advantage of TDP is that it can be applied to any combination of materials with similar melting points. The researchers are now looking at degradable scaffold materials that could provide growing neurites with nutrients, says Koppes.